By using pulses of light, researchers at the UC San Diego School of Medicine have produced, erased, and restored fearful memories in rats. It's a finding that could have profound implications for people struggling with neurodegenerative and anxiety disorders. The study, though not the first to implant a memory in a rodent, is the first to selectively remove a memory — in this case, a conditioned fear response — and then predictably reactivate it by stimulating nerves in the brain at frequencies known to weaken and strengthen the connections between synapses. It's probably the most sophisticated memory engineering experiment done to date. What's more, the study confirms a long-standing theory about how memories are made and stored in the brain. The experiment suggests that the weakening of specific nerve cells likely disassembles neuronal circuits, resulting in the inactivation of a memory. This confirmation hints at future therapies in which neuroscientists can take control of runaway emotional memories in mental illnesses, such as post-traumatic stress disorder. Neuroscientists theorize that memories are formed when connections between neurons are strengthened — a process facilitated by mechanisms such as long-term potentiation (LTP) and long-term depression (LTD). But this has been difficult to demonstrate in the lab. This latest study, which was conducted by Roberto Malinow of the University of California, San Diego, Roger Tsien of NIH's National Institute on Neurological Disorders and Stroke (NINDS), and other UCSD colleagues, proves that a causal link exists between these synaptic processes and memory. It was a confirmation made possible by the burgeoning field of optogenetics — a technique in which a gene is delivered to the brain cell of an animal using a special virus. Once delivered, the gene produces a series of light-responsive proteins which can either be activated or disabled by fiber optic cables inserted into the brain. To date, neuroscientists have used the technique to induce sensations, memories, and behavioral changes in mice and monkeys. In the new experiment, pulses of fibre optic light were used to both remove and reactivate conditioned responses in rats. The first stage of the experiment was to produce a conditioned fear response in the rats. The scientists did so by optically stimulating a group of nerves in rats' brains that had been genetically modified to make them sensitive to light. At the same time, the researchers delivered an electric shock to the rats' feet. The rats thus learned to associate the optical nerve stimulation with pain, thereby triggering fearful behavioral responses. Subsequent analysis showed that the resulting chemical changes were consistent with synaptic strengthening. Following this stage, the scientists weakened this neural circuitry by stimulating the same batch of nerves with a memory-erasing, low frequency train of optical pulses. Following this, the rats no longer responded in a fearful way to the original nerve stimulation. The memory had, for all intents-and-purposes, been erased. For the final and most astounding step, the neuroscientists restored the memory by re-stimulating the same nerves with the memory-forming, high-frequency train of optical pulses. Subsequent experiments shows that the rats were once again responding to the original stimulation with fear. "We can cause an animal to have fear and then not have fear and then to have fear again by stimulating the nerves at frequencies that strengthen or weaken the synapses," noted lead author Sadegh Nabavi in a statement. Looking to the future, and in addition to treating anxiety disorders, a similar technique could be used to treat age-related neurodegenerative diseases, such as Alzheimer's. 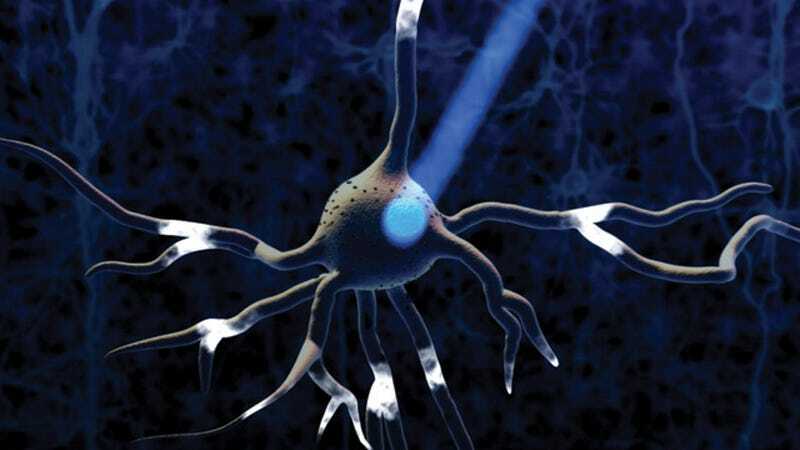 But that's a far way's off; we still don't know how humans will respond to optogenetics. Moreover, for it to work in us humans, we'll have to be genetically modified to respond to the light in specific ways, and have the genes delivered to our brains via viruses. There's clearly a lot of work — and ethical objections — that still need to be overcome. Read the entire study at Nature: "Engineering a memory with LTD and LTP." Supplementary source: UC San Diego. Image: Top image: MIT McGovern Institute & MIT Synthetic Neurobiology Group.